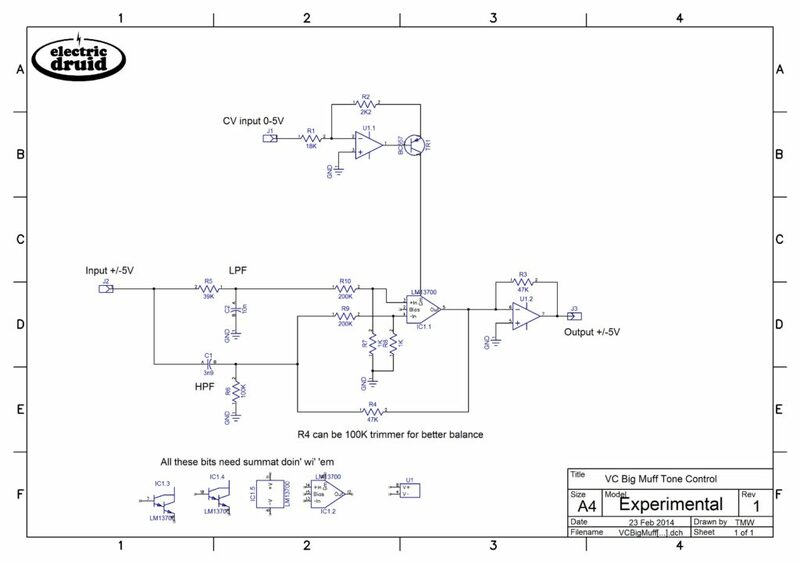 Posted June 9th, 2015 by Tom Wiltshire & filed under Projects, Synth DIY, VCAs + Amplifiers. There are a number of situations where it is useful to be able to crossfade between two different signals with a single control. Examples might be a wet/dry control on a delay effect, or a waveform knob on an oscillator that goes from ramp to square continuously. The simple and obvious way to do this is with a dual-gang pot. Each gang controls one signal, and it’s easy to wire so that as one increases in level, the other decreases, as shown in the graph. But can it be done with a normal single-gang pot? Well, yes, it can. This circuit idea shows how. 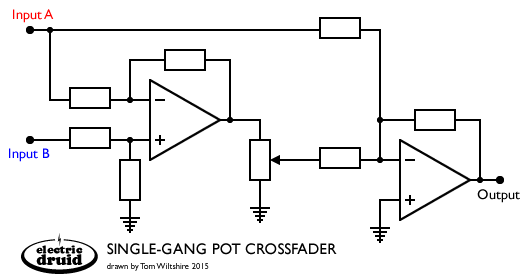 A differential op-amp has its inverting input fed from Input A, whilst its non-inverting input is fed from Input B. The output from the diff amp is Input B plus an inverted copy of Input A. With the Pot grounded, the output mixer only sees the direct signal from Input A. With the pot at the top, the direct signal from Input A is cancelled by the inverted copy coming from the diff amp, and all that you get is the non-inverted Input B. In-between these two extremes, you get a linear crossfade from one input to the other. We can use this same concept to build a single VCA crossfader too. In fact, the single VCA version comes out simpler, since the VCA can fufill the roles of both the differential amp and the pot, and the I-to-V stage that often follows a VCA can be used as the final mixer. Shown below is an experimental voltage-controlled Big Muff Pi tone control that I developed. The Big Muff’s tone control is essentially a passive cross-fade between a lowpass filter and a highpass filter. The circuit isn’t perfect, since the two inputs have different impedances, and the impedances are low enough to interfere with the passive filter networks, but there’s a ton of interactions in the original anyway, and this circuit works well enough as-is. If you remove the lowpass RC and highpass RC and feed the two inputs from different signals instead, what you’ve got is a voltage-controlled single-VCA crossfader. Cool, eh?! I built this using half a 13700 VCA, but it’d work equally well with the (extremely similar) CA3080 single VCA. Or you could use both halves of the 13700 and build a crossfader for stereo signals. instead of LPF & HPF i could use a Audio-Jack and have 2 Inputs (instead of crossfading between LPF-HPF)? the 0-5V CV is this liniar? meens 2,5V is middle (booth Signals equal Gain?) or is it logaritmic… i ask because i will use a DAC to controll it. Yes, absolutely, you can drop the LP and HP filters and crossfade between two audio inputs. 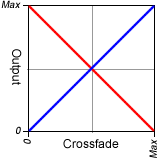 The VCA CV is linear. Controlling it with a DAC shouldn’t be too difficult. Let me know how you get on! This is exactly what I will be doing! What is U1 in the schematic? U1 can be any audio op-amp. I used a dual package. TL072 would probably be the “standard”. You could also use LF353 or a 1458. There are plenty of other more audiophile options too, with prices to match! the schematic looks very interesting. I am looking for a simple single pot (fader!) crossfader. Am I correct than the value of the pot or fader doesn’t matter too much (it goes linearly between the two extreme case, so any value should do that). And would input A not be inverted (if the pot goes to ground)? The value of the pot isn’t critical, but you need to think about it in relation to the value of the resistors. The input impedance of the inverting op-amp will load the pot down if the resistors are of a similar or smaller value than the pot. A good general rule of thumb is that the input resistor should be 10 x the pot value, so with 100K resistors used throughout, you’d use a 10K pot. That way the response of the pot stays genuinely linear. Since the final output mixer is inverting, the output is inverted with respect to *both* inputs, not just input A. Add another op-amp to compensate if that’s a problem. Often this circuit snippet is part of a larger circuit and you can arrange to get one extra inversion elsewhere in the circuit, or sometimes it simply doesn’t matter (mixing oscillator waveforms in a synth, for example). thanks a lot! I will give it a try! Were you able to get the top circuit working? I built it with all equal value resistors, and the signal in the “B” input never fully cancels out. It is always at 25$ blend regardless of the pot setting. Any ideas? You say it’s always at 25% regardless of pot setting? That’s not right. With the pot at the bottom, the Input B signal should be grounded, and there shouldn’t be any way it can get to the output. Try only feeding it one signal and makes user you get the result you expect for each channel, and then try both again. Something is definitely fishy! 1. As “Sigfreed” mentioned above: the input “B” is never get to 100% always i got little from the input “A”, i changed the feedback resistor to 100k trim and its got much better (around 31K) but its never make full crossfaded to B signal, there is any way to get it work properly make 100% A with 0 volts and 100% with 5 volts?? 2. the output is decreased by -8db than the input signal. 3. I’m also tries to use it as “Volume control” and Connected “A” input to Ground, again ther’s no completely silent when the pot is Fully in CCW posiiton (0V), so i removed R4 (feedback resistor) and the 200K input resistor, so the ground connected directly to the LM input. I saw the answer you written above about the 10 times input resitor value, you think its should solve that issue? 1) This is question of getting the balance right between the two signals. As you’ve noticed, having the feedback resistor as a trimmer helps balance them. I don’t know which way around you have “A” and “B” on the VCA, but perhaps the VCA isn’t shutting off completely. 2) You can adjust the output level by altering R3/47K on the output I-to-V stage. There are also examples in the LM13700 datasheet. The pop/click comes from offsets at the inputs of the OTA. These can be trimmed out, and for VCA applications you’ll often see a “zero trim” on one of the inputs for exactly this reason.